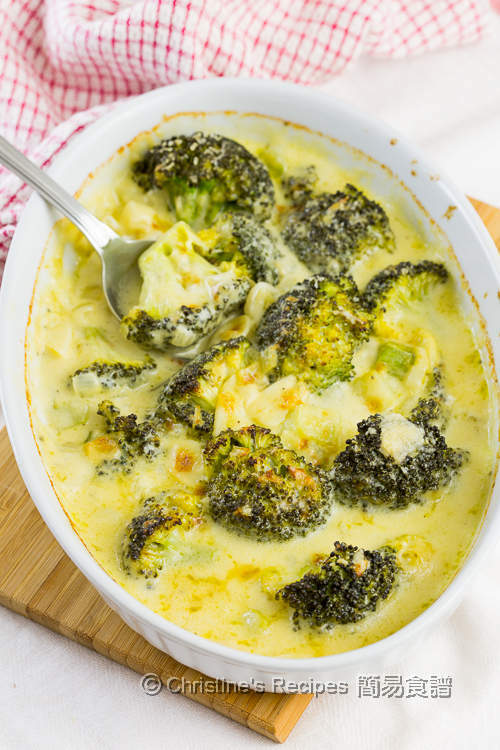 This creamy broccoli casserole is one of my family’s favourite side dishes. You might call it a meatless light meal though. It’s delicious, creamy and smooth, packed with flavours. My kids used to call broccoli as “little trees”, since the shape of a whole head of broccoli is like many little trees growing together. As parents, we tried every method to get our kids to eat more vegetables. Broccoli itself hasn’t got any rich flavours to attract small kids. But its taste turns wonderfully delicious if cooking with other ingredients. 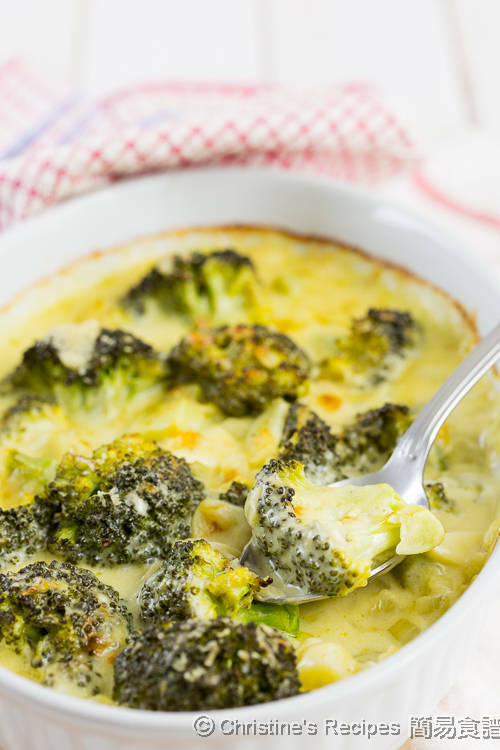 The soul of this baked broccoli dish is the creamy cheese white sauce. Basically, making the sauce is quite like making the French white sauce, béchamel sauce, using butter and flour to form a white roux, then add in some cream. Firstly, saute the garlic and onion to bring up the aroma. I like using the broccoli stems as well. You can peel away the outer skin easily, then chop the stems into large chunks. Sprinkle and stir in plain flour / all-purpose flour and stir fry with the vegetables. Pour in chicken stock and cream. Add broccoli and cheese. The delicious creamy cheese sauce base is ready. The whole dish can be popped in a preheated oven. For the sauce, stirring in some favourite cheese will increase creaminess and thickness. That means the attractiveness will be increased too. Kids and adults in the family love it so much. Rinse broccoli and drain well. Cut into florets. I don’t want to waste the stem. I usually peel away the outer hard skin. Cut them in large chunks. Set aside. Heat butter and oil in a fry pan over medium heat. Sauté garlic and onion. Make sure not to burn the garlic. 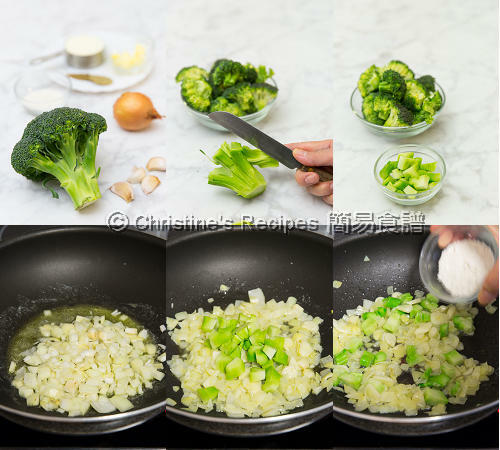 Add the broccoli stem chunks. Sprinkle plain flour in fry pan. Stir to combine and cook for about 2 minutes, and white flour is no longer to be seen. Pour in chicken stock. Bring it to a boil. Add bay leaves, broccoli florets and pouring cream. Stir in half of the cheese. Save the remaining cheese for later use. Transfer the broccoli and sauce into a baking dish. Cover with foil. Bake in the preheated oven on the middle rack for about 20 minutes. Carefully remove the foil. 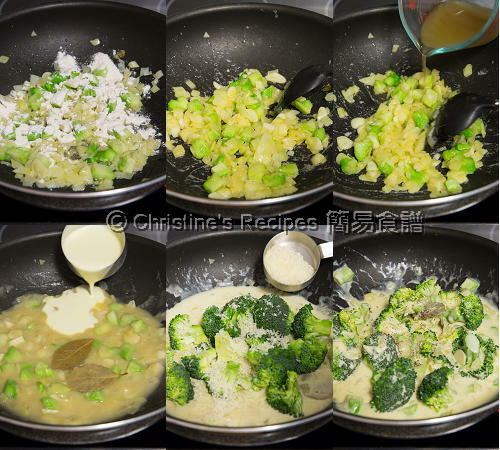 Sprinkle the remaining cheese on top of broccoli. Put the baking dish on upper rack. Increase oven temperature to 200C / 390F. 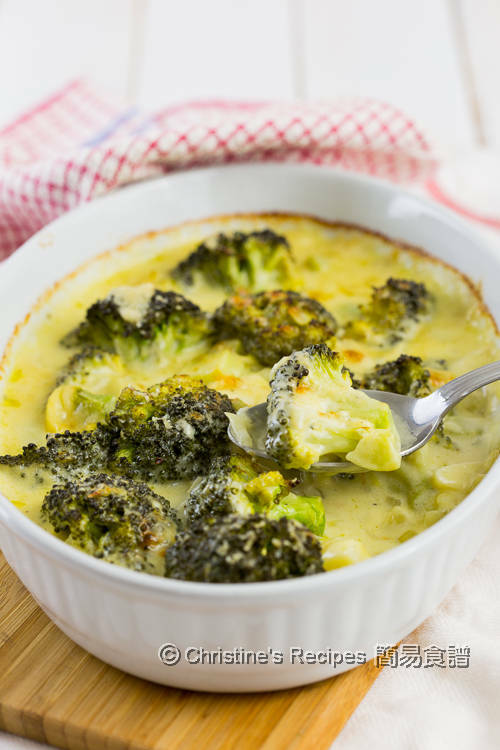 Continue to bake for 8 to 10 minutes, or until cheese melted, and the broccoli is lightly browned. Serve immediately. The amount of cheese can be adjusted according to personal preference. The saltiness of different brand of cheese might be slightly different. Adjust the amount of salt accordingly. You might use regular butter or unsalted butter. Looks very delicious with that creamy sauce!